If your company maintains both an online and offline presence, it can prove challenging to bridge the feedback between the two to create a seamless customer feedback loop. Luckily, it’s not impossible. 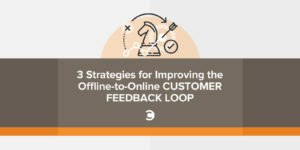 Once you understand how a customer feedback loop should work, you can use the following three offline-to-online feedback improvement strategies to help boost your customer-centricity and deliver an experience your customers will appreciate. Creating a solid customer feedback loop requires more than customer insight. To complete the cycle, you not only need to know what your customers have to say about your brand, but also how to use their feedback to maintain your strong points and strengthen your weak ones. Typically, most businesses solicit some form of customer feedback, such as surveys, reviews, and testimonials. But how you collect this information from offline customers isn’t as easy or efficient as it is with your online buyers. When an online customer conducts business with you, it’s acceptable to request a name, email address, or (for shipping or billing purposes) a physical address, which helps you trace each purchase or download to a particular person. As a result, you can directly segment each customer that fits in your predefined customer feedback loop parameters to gain their insight on their experience with your business. That’s not the case with your offline crowd. You can’t identify the people walking through your door by their name, email address, and purchase history, nor do you know if this is their first or fifteenth experience with your brand. Your online and offline customers are not always one in the same, but that does not mean you can’t include each set into the same customer feedback loop. 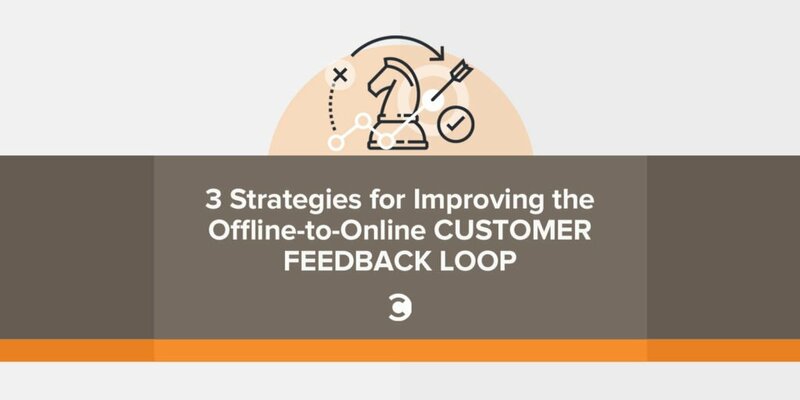 And since it’s far easier—and more sensical—to ask your offline customers for online feedback than the other way around, take a look at these three strategies that can help you seal the gaps in the customer feedback loop, no matter how your customer chooses to do business with you. To begin a successful migration of offline-to-online customer feedback, you first need to know how to contact your buyers. Ask each customer for their name and email address as part of the checkout process, but don’t ask for an entire personal profile. You can always ask for more information if they participate in your customer feedback loop. One important caveat to mention here: You don’t want to force your customers to provide their personal information. If customers are not willing to share their contact details, then it’s likely they won’t want to participate in your feedback initiatives. Once you have collected the customer’s data, send them a welcome or thank you email, along with a CTA to participate in a survey about their purchase experience. You can offer incentives, like a cash prize for a few lucky respondents, to increase engagement. Your initial email can potentially trigger an entire customer lifecycle campaign that periodically requests feedback, either based on subsequent purchases or elapsed time from the first purchase or a variety of other factors. Above all, asking for feedback should never be a one-time occurrence. If you truly care what your customers have to say, make sure you ask them often. To create a successful feedback initiative, you should ask for customer insight in as many ways as possible. The common goal is to get offline responses into an online platform. If you can’t collect customer data in store, you can gain their input via other outlets. Add a QR Code or custom URL to each receipt that directs the customer to a quick survey about their experience. It streamlines the feedback process for the customer and offers neat-and-tidy analytics for your review. Ask customers to leave you a review on your social channels or website, either verbally, on their receipt, or via store signage. Even better, create a printed handout that provides clear instructions for leaving a review on your customer’s favorite review websites. If you offer an app, give your customers a reason to use it while in the store. Target’s wildly successful app, Cartwheel, gives patrons extra savings on items by scanning the barcodes at the checkouts. You can promote special discounts, coupons, digital shopping lists, product reviews, or other incentives only available via the app/store combo in exchange for customer data and feedback in real time. Your online customers already know how to find you in the digital world, so make sure your offline ones do, too. If you engage in social media, make sure you promote your various channels to your in-person audience. Give them reasons to seek out additional information about your brand and where they can find it. Encourage them to post pictures or success stories using a product they bought from you, let them know how they can contact you for customer service, or offer your website address for online ordering. None of the above strategies can completely close the customer feedback loop until you decide to use that feedback to make changes. Seeing how only eight percent of the customers in the survey mentioned earlier agree that they feel like the number one priority, there’s a good chance you have plenty of opportunities to hone your customer experience. Once you collect your data and decide how to reorganize your strategy, make sure you let your customers know about it. Compile mass feedback into a report, and share it with everyone on your email list. Above all, be sure to explain that because of their opinions, you now offer the level of service they expect. You can be sure they will thank you for it.